Recognized as one of the Top 100 Best Arts Festivals by Sunshine Arts Magazine and consider the Best Summer Arts Festival in Metro Atlanta, the Piedmont Park Summer Arts & Crafts Festival is a 2-day outdoor event. With an emphasis on the visual arts and family fun, this event is presented by the Atlanta Foundation for Public Spaces for people of all ages, races, customs, and interests. The Midtown community of Piedmont Park is considered to be home to one of the largest and most enthusiastic art buying communities in metro Atlanta. The Piedmont Park Summer Arts and Craft festival is bringing back the tradition to Atlanta’s arts community. 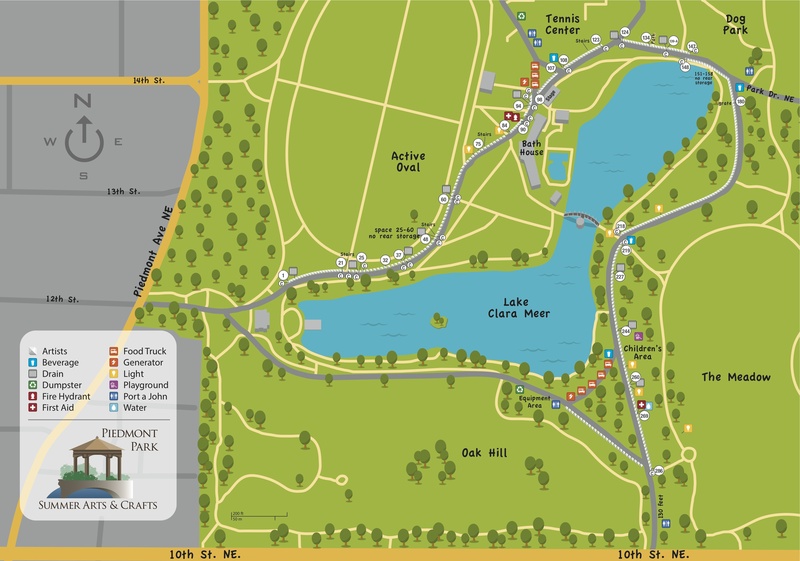 The Piedmont Park Summer Arts Festival is organized by the Atlanta Foundation for Public Spaces, LLC, who also sponsor the fall fine arts Chastain Park Arts Festival and more than a dozen other events, along with a board of experts in various artistic disciplines. The festival will uphold the highest standards supporting the arts and offer participating artists the environment to nurture an appreciation for their skills. Cancellations by confirmed artist participants must be received in writing before 5:00 p.m. on July 09, 2018 for a refund of booth fee. Application fees are non-refundable and a $50 Adminstration fee will be applied to all refunds. On street parking is available in the surrounding neighborhood. Paid parking options will also be available for festival goers and artists. Artists who have not checked-in by Saturday at 8:00 a.m. will be considered a “no-show.” No Show artists are not eligible for refunds. Assigned space(s) will be forfeited to a wait-list artist. Artists are responsible for collecting and reporting Sales Tax. A Sales Tax reporting document is provided to participating artists at check-in at the event. The current Sales Tax rate for this event is 8% (Georgia 4%, Fulton County 3%, City of Atlanta 1%). 2. Prior to the Festival, Exhibitors will be notified of their site location and detailed setup information. Plan to set up your booth on Friday before the Festival. (Please do not call for Booth assignments, once they are completed they will be posted on Zapp). 5. The Festival is a rain or shine event. Cancellations must be made submitted in written form by mail or email before 5:00 p.m. on July 13, 2018. By mail: send to P.O. Box 422571, Atlanta GA 30342. By email: to info@affps.com. No refunds will be given for cancellations less than 30 days prior to the event date or for no-shows, cancellations will also incur a $10 admin fee. 14. Artist must be present, we do not permit Artist representatives or employees of the Artist to manage the booth. By applying online or signing a written application, you agree to indemnify, hold harmless, and defend the Atlanta Foundation for Public Spaces and the Georgia Foundation for Public Spaces dba Piedmont Park Arts Festival and all of its officers, employees, servants and agents, against any and all liability claims, cost of whatever kind and nature, for injury to or death of any person or persons and for loss and damage to any property (State, County or other) occurring in connection with or in any way related to or arising out of the occupancy, use of premises or providing of services and equipment at the Festival.